Teams have fully prepared themselves to go in up front and catch the winning title of the match because last matches played by both teams have not been in the favor of them Both the teams have lost their respective matches i.e. Sunrisers Hyderabad lost its match against Chennai Super Kings and Rajasthan Royals have been defeated from Kings XI Punjab. Previous records of both the teams have not been into their favor. Both the teams are well-organized and a mixture of good batsman and bowlers. 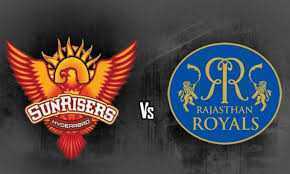 Sunrisers have been called “Orange Army” have not into their hood in the last match neither Rajasthan Royals balanced charismatic team led them to win the post. Both will try to name the winning position by their names. The teams have been encountered 9 times before this match and it’s has been a tough knot to open up with their loss and winning chances. Facts and last match score analysis conclude to be in a tight position with 51% chances of Rajasthan Royals to win from 49% of Sunrisers Hyderabad to win. Top Bowler Bhuvneshwar Kumar, Siddharth Kaul, Shahbaz NadeemSandeep Sharma, and Shakib Al Hasan.